For the mythical sisters, see Pleiades (mythology). The Pleiades (also known as M45 or the Seven Sisters) are a group of stars in the night sky. You can see them in the constellation Taurus, the bull. Charles Messier gave it the name M45. They are named after the Pleiades in Greek mythology. This an open star cluster of middle-aged hot B-type stars in the constellation of Taurus. It is one of the nearest star clusters to Earth, and is the cluster most obvious to the naked eye in the night sky. The cluster is dominated by hot blue and extremely luminous stars that have formed within the last 100 million years. 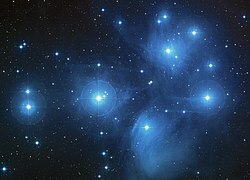 Wikimedia Commons has media related to Pleiades. This page was last changed on 9 March 2015, at 16:42.